63RD SESSION OF THE COMMISSION ON THE STATUS OF WOMEN: The 63rd session of the Commission on the Status of Women (CSW63) took place at United Nations Headquarters in New York March 11-22. The priority theme was “Social protection systems, access to public services and sustainable infrastructure for gender and the empowerment of women and girls.” CSW meets annually to discuss progress and identify gaps and challenges in the implementation of the Beijing Declaration and Platform for Action. 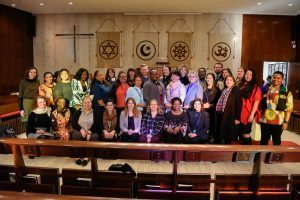 This year, LOWC welcomed 32 Lutheran delegates from seven countries (Palestine, Tanzania, Peru, Colombia, Liberia, Switzerland and the United States). This delegation consisted of representatives from the Lutheran World Federation’s (LWF) Women in Church and Society, the LWF Waking the Giant Initiative, the ELCA (including from Global Mission, International Leaders Program, Advocacy, ELCA World Hunger, Justice for Women and Women of the ELCA). 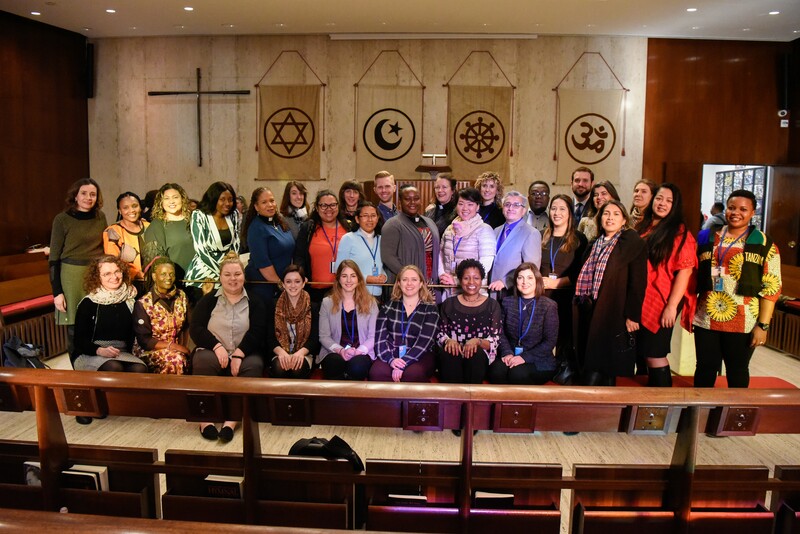 CSW63 concluded with the adoption of the agreed conclusions. 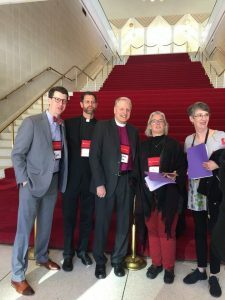 LUTHERAN LOBBY DAY: LOPP-CA is pleased to announce our first Lutheran Lobby Day at the State Capitol on Wednesday, May 29. Plan to join our bishops, clergy, members, and Rev. Amy E. Reumann, ELCA Advocacy Director, as we build relationships with legislators and policy-makers and fellowship with one another. We will gather at St. John’s Lutheran Church in Sacramento at 8 a.m. and will progress to the Capitol together around 10 a.m. Our goal is to have every single Assembly district represented, so we need you there. A block of rooms has been reserved at the Residence Inn Sacramento Downtown at Capitol Park (a block from St. John’s and two blocks from the Capitol building). Mention LOPP-CA when making your reservations to get our discount. We look forward to seeing you there. SOCIAL MEDIA CAMPAIGNS: Our social media relaunches are underway! Please visit us on Facebook at Lutheran Office of Public Policy- California. We are sharing updates, articles and time-sensitive action items. Like, share and repost our content. The policy council has a goal of getting 5000 by the end of the year. You can help us meet our goal and stay up-to-date with the activities. Plans are underway for Twitter, LinkedIn and YouTube. Watch this space! LEGISLATIVE SESSION: We are more than halfway through the Colorado legislative session, and several of our top advocacy priorities are awaiting key votes in committees and on the floor. Death penalty abolition (SB 182): The bill is awaiting debate and consideration on the Senate floor. We have an active action alert for constituents to contact their senators about this critical issue. Paid family leave (SB 188): The Senate Finance Committee is considering this bill and will vote during the first week of April. We are encouraging constituents to contact the five committee members. Eviction notice extension (HB 1118): This bill will have key Senate hearings next week after passing the House floor. Climate action (HB 1261): We have joined the Colorado’s Climate Future coalition to support this critical bill to reduce our state’s carbon footprint. It will have its first hearing in early April. CONGREGATION VISITS: Thanks to the good people at King of Glory Lutheran church, Loveland, and Evergreen Lutheran church, Evergreen, for inviting LAM-CO to speak to your congregations! It is a blessing to equip the body of Christ to take up our common call to public witness and ministry. FAITHFUL TUESDAYS: We continue to gather weekly as the faith community every Tuesday at noon inside our State Capitol rotunda. All are welcome! Learn more at www.faithfultuesdays.org. The Florida Interfaith Climate Actions Network pushing for a ban on fracking and relief for Hurricane Michael victims. The legislature is completing its committee work and will be holding regularly sessions of the House and Senate going forward. Plans are underway for advocacy training across the state and an advocates faith organizing retreat later in the year. The legislature will take up work again in September with committee weeks, where bills will be drafted for the 2020 session that begins in January. This weekend (April 5-6), Rev. Dr. Russell Meyer, director, will be a co-host of the Rise Up: [Sea Level] Realities and Opportunities at a climate conference at St. Petersburg College (https://solutions.spcollege.edu/) that focuses on the impact in Tampa Bay projected by the National Climate Assessment and the Intergovernmental Panel on Climate Change. URGENT ACTION ALERT: AFFORDABLE HOUSING: Call/email your state legislators and urge them to support the full Homes for All agenda as they weigh priorities in the omnibus finance and tax bills. (Link to that agenda). Speak from your experience or that of your church to describe the housing crisis in your area. Committee leaders in the Minnesota House and Senate are putting together big omnibus (appropriations) bills in consultation with their leadership. We want to make sure that affordable housing is strongly positioned in this process, especially since the new committee fiscal targets are much lower than is needed. GOVERNOR’S CLEAN ENERGY BILL: 100% CARBON-FREE ELECTRICITY GENERATION BY 2050: (HF 1956, Long). This bill includes a Clean Energy First provision (clean energy must be considered for its cost and merits, before looking to fossil fuels or other energy). It also establishes preference for local hiring and tools to guarantee a prevailing wage for those jobs. 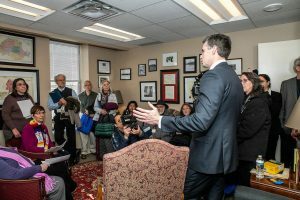 It would increase the Conservation Improvement Plan requirements from 1.5 percent to 1.75 percent year over year to improve energy efficiency, and doubles utilities’ efficiency investments ($16-20 million) in the homes of low-income Minnesotans. (Note: it is one of two 100% Clean Electricity bills. The other has benchmarks by specific dates. We support both bills. The Gov. Walz bill is more likely to have a chance of passing). We have lots of new content on our website under Clean Energy. Soon we’ll have pictures and videos from the March events, too. 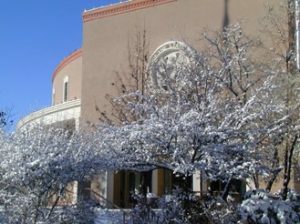 THE 2019 SESSION OF THE NEW MEXICO STATE LEGISLATURE HAS ENDED: LAM-NM advocated for legislation that reflected the issues included on our advocacy agenda. LAM-NM also represents the New Mexico Conference of Churches. A number of the bills we supported were passed by both chambers and made their way to the governor’s desk for consideration. Governor Michelle Lujan Grisham has until April 5 to sign or veto legislation. Among the bills under consideration are increasing the state minimum wage to $12; protections for domestic workers under the state minimum-wage law; stricter requirements and reporting for small loans; creation of the middle-level dental profession of dental therapist which can expand access to dental care for low income New Mexicans; prohibiting trafficked minors from being charged with prostitution; prohibiting solitary confinement for children, pregnant women, and people with a serious mental illness; and increasing the state Working Families Tax Credit, which piggy-backs on the federal Earned Income Tax Credit, to 17 percent. We will let you know next month what bills the governor signed! LUTHERANS AT THE LEGISLATURE: On March 26, the North Carolina Synod hosted its first Advocacy Day at the North Carolina General Assembly. Bishop Tim Smith welcomed legislators to a prayer breakfast and shared our concerns about the state’s lack of affordable housing, the rising rate of homelessness, and the increase of both after Hurricanes Florence and Michael ravaged 28 Eastern counties last fall. While legislators attended to committee responsibilities during the morning, ELCA members and friends gathered to learn from Sam Gunter, executive director of the North Carolina Housing Coalition, and Bill Rowe, general counsel of the North Carolina Justice Center, and from Ryan Carter, member of Christ-Providence, Charlotte, who works in advocacy and outreach for Habitat for Humanity in Mecklenberg, and Jenny Simmons, member of St. Mark’s, Asheville, who works for Homeward Bound, a non-profit dedicated to ending homelessness in the Asheville area. The Rev. Marissa Krey of Lutheran Services Carolinas covered the mechanics of making an advocacy visit. The 45 attendees then spent the afternoon meeting with elected offic ials and legislative staffers. 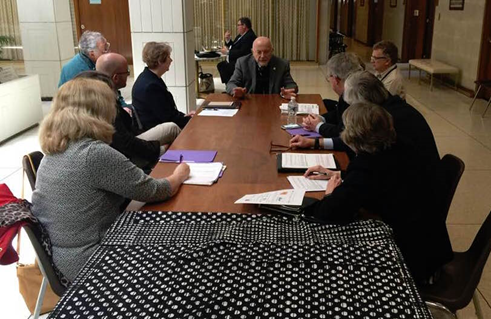 Attendees, SJAM Task Force leaders and synod staff are pursuing follow-up conversations with legislators to provide additional information and strengthen their newly-formed relationships with policy makers. 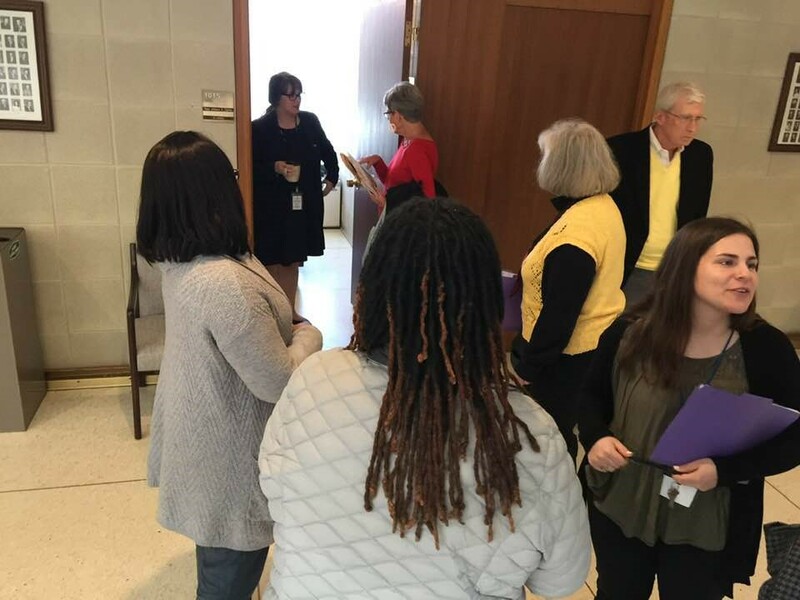 Special thanks are due ELCA congregations Holy Trinity and Good Shepherd, Raleigh and St. Paul’s, Durham for hosting the educational forum, providing hospitality, meals, and transportation assistance between venues. STATE BUDGET: The state budget in Ohio is in full swing! We are excited to be working in coalition with people and organizations concerned about the hungry, the widow, and the orphan throughout Ohio to guarantee that our budget reflects our values. Budgets are moral documents and set the direction for Ohioans moving forward. ADVOCACY DAY: Our first statewide advocacy day was April with members of the House of Representatives. We will convene again on May 14 to talk with state senators. Governor DeWine’s budget proposal lays out a priority of caring for children. His proposal joined by the “Cupp-Patterson” plan to improve school funding in Ohio will go a long way toward investing in Ohio’s future. However, without improvements to Ohio’s revenue system, we will lack the resources needed to make the important investments into affordable housing, clean water, ending hunger, and opioid treatment. Read our takeaways from the governor’s budget proposal here. THE STATE OF OHIO: Our close partners recently wrote a report about the state of Ohio and the barriers we face. 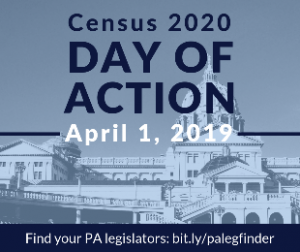 LAMPA SHARES ACTION ALERTS: Three advocacy alerts were shared with LAMPa constituents: public comment period (ended April 2) for SNAP time requirements; the 2020 Census Action Day, April 1; and General Assistance in Pennsylvania once again being threatened by HB 33. ASHES TO GO SHARED AT CAPITOL: Staff offered prayers and imposition of ashes at the State Capitol on Ash Wednesday. Those receiving ashes expressed their sincere appreciation. 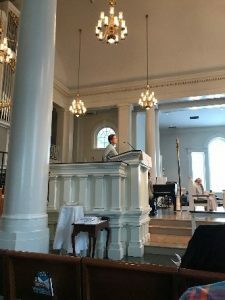 STAFF ACTIVITIES: Director Tracey DePasquale taught at Trinity Lutheran Church, in Lansdale, about the importance of the church’s voice in the public square in these divisive times. She also attended the Lower Susquehanna Synod Racial Justice Task Force meeting and participated in Civil Conversations Facilitators Training, sponsored by Interfaith Philadelphia. DePasquale and program director Lynn Fry collected signatures from hunger ministries throughout the state for a letter to lawmakers in support of funding for the State Food Purchase Program and Pennsylvania Agricultural Surplus System. Staff recently attended the Keystone Research Center and Pennsylvania Budget and Policy Center 2019 Budget Summit. Highlights included an overview of Governor Tom Wolf’s 2019-20 budget proposal and challenges facing Pennsylvania; a legislative panel discussion, and workshops on a variety of topics. PLANNING CONTINUES FOR LUTHERAN DAYS IN THE CAPITAL: Sunday May 19 Come to the Welcome Table! Learn more. 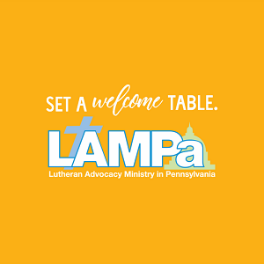 Monday, May 20 — LAMPa’s traditional Lutheran Day of Advocacy — Set a Welcome Table! features keynote speaker Kathryn Lohre, assistant to the ELCA Presiding Bishop. Learn more and register. These are a few bills we supported that have already passed. HB 346 Healthy Housing: This bill prohibits retaliatory eviction of tenants who complain to code enforcement about unsafe and unhealthy rental housing conditions. HR 164 Dedication of State Revenue: This resolution proposes an amendment to the Constitution to authorize the General Assembly to provide by general law for the dedication of revenues derived from fees or taxes to the public purpose for which were imposed. HB 514 Georgia Mental Health Reform and Innovation Commission: This bill creates a Mental Health Reform Commission which will perform a comprehensive review of the behavioral health system in the state. HB 281 Crimes and offenses; pimping and pandering; increase penalty provisions: This bill increases the penalty provisions relating to pimping and pandering. TENNESSEE: Our Tennessee advocates continue to support full Medicaid expansion. VIRGINIA GENERAL ASSEMBLY WRAP-UP: Now that the Virginia General Assembly has wrapped up, VICPP is heading around the state to discuss the outcomes of the 2019 session. We will share our big wins, challenges, and what we hope to work on in 2020. We would love to see you there – all are welcome! Keep Washington Working (SB 5497) which has been worked on for many years. It would separate state agencies such as local law enforcement from coordinating with Immigration and Customs Enforcement. The final hurdle is a floor vote in the House. property leverage with certain zoning laws. This bill needs a floor vote in the Senate. FINI (HB 1587), or the Food Insecurity Nutrition Incentive, which would increase access to fresh fruits and vegetables for those on SNAP. It has $2.5 million allocated in the House’s budget proposal and still needs to move through the Senate. TANF Reform (HB 1603) which needs to move through Senate fiscal committees. Eviction Reform (SB 5600) which would alleviate homelessness through less evictions. It is waiting for a floor vote in the House. Closing the loophole on capital gains taxes and instituting a 9.7 percent tax is in the House-proposed budget. This would increase state revenue by $1 billion each year. Progressive reform of our Real Estate Excise Tax is also in the House Budget proposal. This would generate $200 million each biennium to support affordable housing. 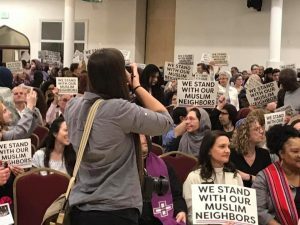 EVENTS, VIGRILS, RETREATS, AND RALLIES: We have also had a busy month of events, vigils, meetings, retreats, and rallies. We stood in solidarity with our Muslim neighbors at vigils after the horrific attacks in New Zealand. We attended the ELCA Domestic Mission staff in Chicago for a retreat. We have joined in support at labor union rallies and contract negotiations. 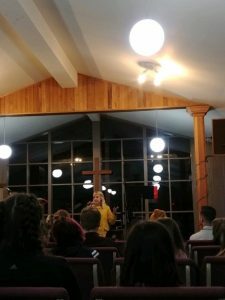 Hunger Advocacy Fellow Sarah Vatne was the speaker at the Southwestern Washington Synod ELCA Youth Gathering, talking with the youth on the importance of advocacy and using your voice and privilege. 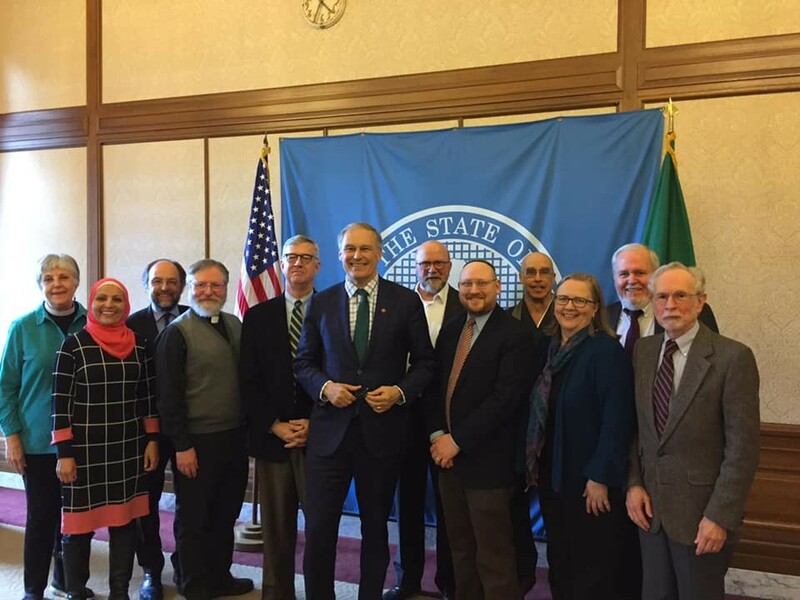 FAN co-directors Paul Benz and Elise DeGooyer joined leaders from many of the faith communities in our network at our annual Interfaith Governor’s Meeting. 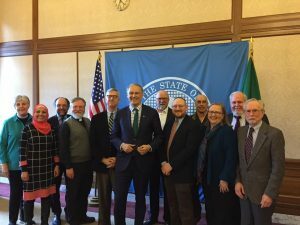 They joined Governor Jay Inslee to discuss our priorities this session as people of faith. Women of the ELCA presidents from the East Central, Northwest, and South Central Wisconsin synods near the microphone. 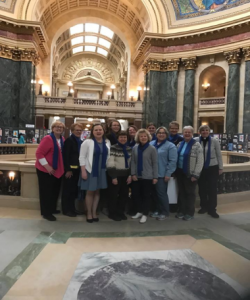 ANTI-HUMAN TRAFFICKING, SAFE HARBOR: Nine Women of the ELCA members, a friend of Women of the ELCA, LOPPW staff, and a volunteer registered in favor of a Safe Harbor bill. A repeated request was to not only support the bill, but bring it to the floor. We are the closest as we have been to getting the bill passed. 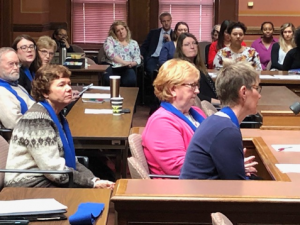 EDUCATING COMMERCIAL DRIVERS: Women of the ELCA was also present with LOPPW staff at a hearing for another bill, that would require commercial driving schools to include curriculum on recognizing the signs of human trafficking. STATE BUDGET: We have been involved with a coalition that shares strategies in responding to the budget throughout the budget process. As part of another coalition, People of Faith United for Justice, we are organizing an advocacy day for April 11. LOPPW will lead a workshop on water and the state budget. 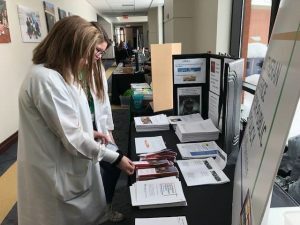 CARE FOR GOD’S CREATION- WISCONSIN CLIMATE TABLE: LOPPW was part of a two-day workshop on equity and deep de-carbonization to explore how equitable we are when advocating for ways to address climate change caused by humans. LOPPW att ended two informational hearings organized by the Speaker’s Task Force on Water Quality in Wisconsin and one public hearing on a bill related to water. SYNOD EVENTS: Walking Together combined with a youth event in the Northwest Wisconsin Synod.